Last week, I received a long awaited email from Schober Orchards in Monroeville, NJ. It announced that their home market would be opening for the season on Friday, July 11 – and the reason for the opening – PEACH SEASON IS HERE! I absolutely love Jersey Fresh Peaches, and for the last decade (possibly longer) our family has gotten peaches from Schober Orchards. Before I could even email my parents to make plans to head down this week some time, my father sent me a text saying he was going on Saturday, and how many peaches did I want. He knows me well. So on Sunday, my parents came to visit, and dropped off about a dozen of the most beautiful peaches – soft and fuzzy, some still with leaves on them – and the aroma was the essence of summertime. 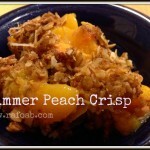 I couldn’t help myself, and immediately put together a quick Summer Peach Crisp for dessert. The children and I enjoyed it so much, that the leftovers then became breakfast. Its fruit, oats, nuts – all breakfast food – so I figured why not! 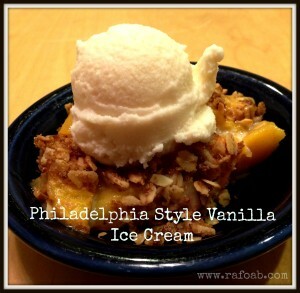 And if you want to have your Summer Peach Crisp a la Mode, and really who wouldn’t want to add ice cream to just about everything this time of year, then you should also check out this recipe for Philadelphia Style Vanilla Ice Cream. 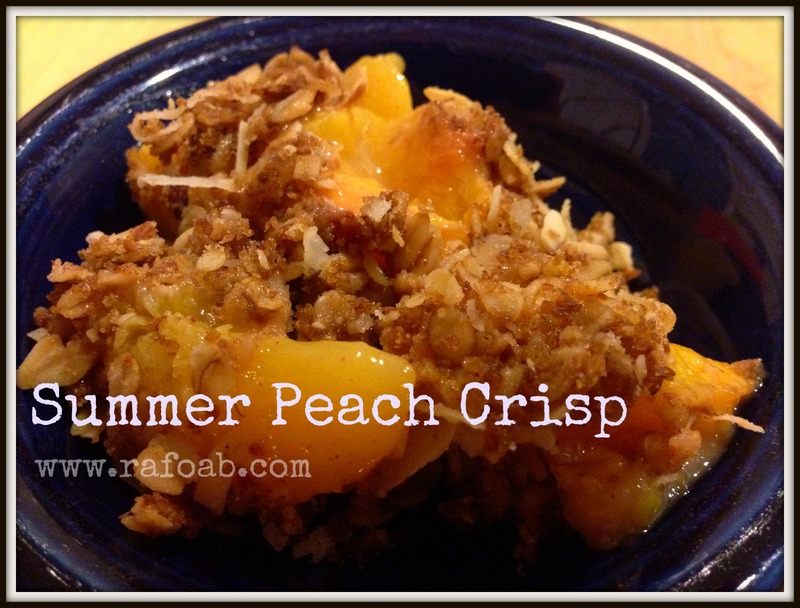 It was so easy to throw together with ingredients that we already had on hand, and really was a nice creamy compliment to the warm peach crisp. Mix the sliced peaches with the flour & cinnamon. Pour the fruit mixture into a 9x9 baking dish. Combine all of the topping ingredients together. You may need to use your hands to fully incorporate the butter. Once combined, pour over top of the fruit. Bake for 40-45 minutes, or until the fruit is bubbly and the crisp topping is evenly browned. Serve warm or at room temperature. If almonds aren't your thing, you can include whichever nuts you choose. Pecans also pair nicely with the peaches.